The Facetmobile (properly, FMX-4 Facetmobile) is a homebuilt aircraft designed by Barnaby Wainfan, a well known professional aerodynamicist and homebuilt aircraft expert. 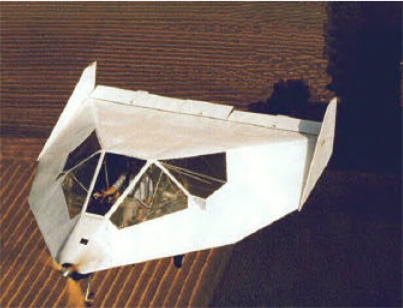 As noted above, the Facetmobile is a unique airfoil shape, but is generally similar to some other generally low aspect ratio delta wing light aircraft, such as the Dyke Delta models JD1 and JD2, the Hatfield LB1 and LB3, and the ARUP 2. The FMX-4 Facetmobile shape forms 11 flat planes, plus two wingtip rudders. Three flat shapes form the bottom of the aircraft (slightly inclined front, flat middle, and sharply raised back), and eight form the top (one large downwards sloping rear section, one thin nose section, and three inclined side panels per side). The wing section is an 18% thickness ratio, much thicker than the typical 12-15% thickness of normal light aircraft wings. The facetmobile structure is 6061 aluminum round tubes, joined together by rivetted gussets, and covered in a fabric covering. The prototype FMX-4 Facetmobile crashed on October 13, 1995, after an in-flight engine failure. The aircraft landed at low speed into a barbed wire fence which caused extensive skin, engine, and some structural damage, though there was no injury to the pilot (Barnaby Wainfan). As of 2006, the aircraft has been partially repaired but not flown again. Wainfan has proposed two derivative aircraft based on the FMX-4 Facetmobile. FMX-5 Facetmobile, a larger 2-seat design using the same aluminum tube and fabic construction. An unnamed similar 2-seat design using advanced flat composite panel construction. This page was last edited on 6 March 2007, at 07:51.